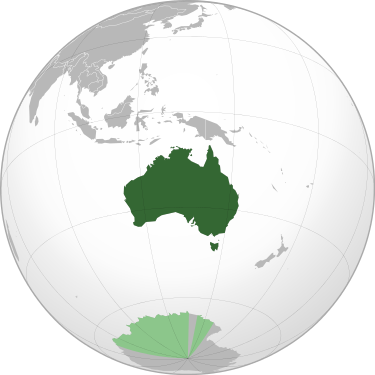 Driving in Australia, driving distances in Australia between capital cities and major destinations. 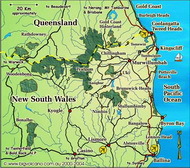 Travellers tips and general information for visitors about road travel in Australia. We drive on the left hand side of the road here. Motor vehicles are almost always right hand drive, with a choice of automatic, manual (stick shift) and 4WD or AWD (all wheel drive) for passenger model vehicles. International visitors often under estimate the distances between towns and cities, and the amount of time it takes to travel by road around Australia, which is almost as big as the United States. The relatively small population (24 million) lives predominently on the coastal fringes, with distances of 100 klm or more common between regional and rural towns, sometimes connected by poorly engineered and maintained roads. We have had our share of serious accidents and fatal crashes involving overseas visitors. Oveseas drivers should familiarise themselves with local road rules. If you staying mostly in cities or major towns, and driving only on highways, an automatic shift vehicle will be sufficient for most people. If you intend to do a self drive holiday off the beaten track or through more than one state, you will need to be a competent and confident driver, especially if you are inexperienced with distance driving. It is highly advised to “Stop, Revive, Survive” evey two hours when driving. During school holidays and long weekends, volunteer organisations (usually the local Lions, Apex or Service Club) provide free refreshments at designated “Driver Reviver” stations, but whenever you travel in Australia, you should schedule regular stops, especially if you are doing a long trip, like Sydney-Brisbane-Cairns, or similar driving tour. The New South Wales (NSW) Roads and Traffic Authority (RTA) has an excellent Holiday Driving resources page, with information, tips and links to Pacific Highway information, traffic reports and speed camera locations, roadside rest areas (or your can check out the National Public Toilet Map) and downloadable PDF driver reviver stop maps. A separate online RTA regional traffic report for the Northern and Hunter Region advises on roadworks, upgrades and delays from Sydney to the Queensland border. Dirt Roads: In rural areas, narrow paved or gravel (dirt) roads are common, and you may find yourself driving on the road shoulder approaching a blind bend or hill crest to ensure sufficient passing space should a vehicle be coming from the opposite direction. Speed limits: A 40 klm 50 klm per hour speed limit applies in many residential areas in towns in our region, with 60 klm per hour in other residential/commercial zones. A 100 klm (or maximum 110 klm indicated) speed limit applies on most open roads and highways..
Wildlife and Livestock: In rural and regional areas (and near golf courses, parks and national parks in towns and cities), you may see wildlife on the road side at dusk and dawn. In rural areas dairy cows may use the road, and in the outback, grazing cattle and feral animals (camels, water buffulo, goats, or horses - aka "brumbies") may wander onto the road or use it themselves. Speed Cameras: Speed cameras are installed at well known speeding locations and accident "black spots", where safety can be improved with lower speeds. Some camera locations are well signposted, but police and highway patrols are now frequently setting up "hidden" speed traps. Just stick to the posted speed limit, and you won't have a problem. Seat Belts: It is compulsory for every passenger in a vehicle to wear a seat belt. If the vehicle is stopped by a police or highway patrol, the driver will receive an “on the spot” fine for each person not wearing a seat beat. DUI: It is a criminal offence in all Australian states and territories to drive a vehicle while under the influence of alcohol or drugs. The maximum legal blood alcohol level is .05% for private sedans drivers, and zero percent (0%) if you are driving a truck, coach or multi passenger vehicle. Australian police in all states frequently conduct “drink/drive” road blocks where you must stop if directed, and be breathalized. If you are over the limit, you will be charged. Saliva swab tests for drugs are now also frequently applied. Important Note: This information should be used as a guide only. Driving distances are approximate, and will vary according to the route taken and roadworks/highway upgrades since publication. National highways and main arterial roads only are used, even though some secondary local routes maybe shorter. For accurate driving distances and driving times, a visit to the local Automobile Organistion in your state is advised, for current maps and information. STOP. REVIVE. STAY ALIVE: To avoid driver fatigue, stop and rest for at least 15 minutes every 2 hours. *Alice Springs, or "The Alice"
For driving distances between towns in the Northern Rivers of NSW, see this chart. YouTube video: "7 Drive Safety Tips for your self-drive holiday in Australia - English language". Britz Campervan, 4WD & Car Rentals Published on Nov 25, 2014. YouTube video: "Outback Australian wildlife". Paul M Published on 27 Jul 2013.